The Heritage at Meridian Gardens offers a secured environment tailored to those with Alzheimer’s or other forms of dementia. We offer both shared and private suites, as well as comfortable common areas designed to create engagement amongst our residents. 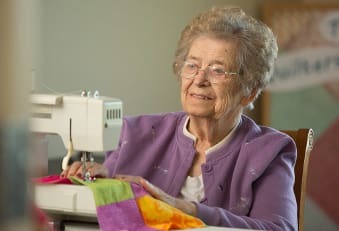 Our Memory Care Community in Columbus, NE, is designed to be both stimulating and supportive. An extensive – and enclosed – courtyard was designed solely for the use of those with memory loss. Residents can stroll along the large walking paths, enjoy the vibrant-colored flowers, and take in the Nebraska weather – all in a secured environment. Based on the philosophies and principles of Dr. Maria Montessori, our exclusive Portraits program is centered on enhancing our residents’ abilities - what they can do instead of what they can’t. 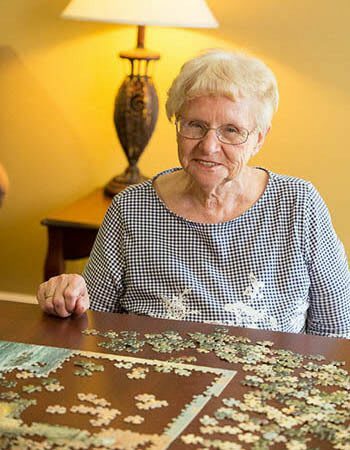 Our goal is to support the cognitive loss many of our Memory Care residents face, and create individualized programming for them, that adds purpose and meaning to their lives. Our team regularly gathers to review items, photos and stories collected from residents’ families, giving us insight into ur residents’ pasts. Where are they from? What did they do? What brings them joy? Who did they love? Our team members then share their own observations about each resident’s needs, abilities, challenges and what responsive behaviors are occurring and why. This allows the team to develop individualized programs, giving each resident roles and routines.